For other people named Eddie Jordan, see Eddie Jordan (disambiguation). Edmund Patrick Jordan (born 30 March 1948), also known as EJ, is an Irish former motorsport team boss, businessman and television personality. Born in Dublin, Jordan worked first at the Bank of Ireland. He won the Irish Kart Championship in 1971 and moved to Formula Ford in 1974. He was the founder and owner of Jordan Grand Prix, a Formula One constructor which operated from 1991 to 2005. He was the chief analyst for Formula One coverage on the BBC from 2009 to 2015 before joining Channel 4 after BBC pulled out in 2016. In February 2016, it was announced that Jordan would join Top Gear as a presenter. Jordan was born Edmund Patrick Jordan at the Wentworth Nursing Home in Dublin on 30 March 1948, the son of Eileen and Paddy Jordan. He has one older sibling, Helen. His father was the twin brother of a senior nun, Mother Rectoress of the Irish Sisters of Charity and worked as an accountant for the electricity board. At ten months old, Jordan developed a form of pink disease and his family were advised by doctors to move from Dublin to Bray for "fresh air". His mother Eileen was advised to "take him out of woollens and into cotton during the month of May", advice she opposed, initially. Nevertheless, she conceded and Jordan's condition did gradually improve. During his childhood, Jordan grew up in Dartry, south Dublin and Bray, County Wicklow. He spent most of his time in Bray, where he became close with his Aunt Lilian, having regularly travelled to visit her at the end of the school week. In his childhood, Jordan was known by the nickname "Flash" as his surname rhymed with the name Gordon. Jordan began his education at Saint Anne's Pre-School in Milltown later spending eleven years at the Synge Street Christian Brothers School, where he and his fellow students would be regularly beaten if they did not study hard. Despite this experience, Jordan found the level of education to be high. While at Synge Street, aged 15, Jordan briefly considered becoming a priest. Having dismissed the priesthood and family pressures to enter dentistry, he ended up taking a six-week accountancy course at the College of Commerce, Dublin, and then began working for the Bank of Ireland as a clerk at their branch in Mullingar. After four years, Jordan moved to the branch in Camden Street, Dublin. During a banking strike in Dublin in 1970, he spent the summer on the island of Jersey, working as an accountant for an electricity company by day and doing bar work in the evenings. During this period, he encountered kart racing for the first time, and had his first (unofficial) races there at St Brelade's Bay. Upon his return to Dublin, Jordan bought a kart and began racing. He entered the Irish Kart Championship in 1971 and won it. In 1974 Jordan moved up to Formula Ford, the Irish Formula Ford Championship and in 1975 to Formula Three, but was forced to sit out the 1976 season after shattering his left leg in a crash at Mallory Park. After his injuries had healed, he switched to Formula Atlantic, won three races in 1977, and won the Irish Formula Atlantic Championship in 1978. Jordan and Stefan Johansson raced in British Formula Three in 1979, under the name "Team Ireland" and, in the same year, Jordan drove in one Formula Two race and did a small amount of testing for McLaren. At the end of 1979 and short of money, Jordan founded his first team, Eddie Jordan Racing, which ran drivers David Leslie and David Sears in 1981 at various events in and around Great Britain. In 1982 his primary driver was James Weaver; in 1983 Weaver ran again in European F3 and Jordan hired Martin Brundle, who finished second to Ayrton Senna in British F3. In 1987 the team employed Johnny Herbert, who proceeded to win the British Formula Three Championship. Jordan also entered a Formula 3000 team, whose first wins came with drivers Herbert and Martin Donnelly in 1988. In 1989 the Jordan F3000 team dominated the season and Jordan driver Jean Alesi won the championship. 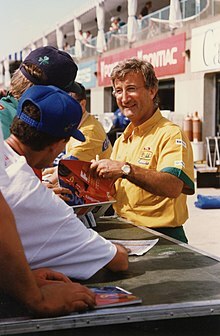 During 1989, hired Reynard Chief Designer Gary Anderson becoming Donnelly's engineer and overseeing operations of the team eventually joining full-time on 4 February 1990. A host of drivers owe their breaks to Jordan. Drivers who have won Grands Prix who have driven for him include world champions Damon Hill, Nigel Mansell, Michael Schumacher and Ayrton Senna, while Jean Alesi, Rubens Barichello, Thierry Boutsen, Giancarlo Fisichella, Heinz-Harald Frentzen, Johnny Herbert, Eddie Irvine, Roberto Moreno, Ralf Schumacher, Jarno Trulli, Martin Brundle and John Watson also drove in Jordan cars. Jordan founded Jordan Grand Prix in 1991 with Anderson as Chief Designer. The team quickly gained its respect and punched above their weight on a number of occasions during the season. Jordan gave Michael Schumacher his Formula 1 debut in the team's debut season. After one race for the team, Schumacher was lured away to rivals Benetton. In 1998 the team achieved its best ever result when drivers Damon Hill and Ralf Schumacher finished first and second at the Belgian Grand Prix. In 1999, Jordan achieved their F1 zenith when Heinz-Harald Frentzen became a genuine contender for the championship, ultimately finishing third, the best placing ever of a Jordan driver and accumulating two race wins along the way. He was leading the European Grand Prix, but retired because of electrical problems. Had he won the race, Frentzen would have been within a point of the championship lead with two rounds remaining. After losing a Honda engine partnership deal to the BAR team in 2002 and numerous difficulties within the team (including a very public row and the sacking of Frentzen before his home GP in 2001), Jordan was forced to switch to expensive Cosworth engines. The added burden of this plus DHL withdrawing their sponsorship and Benson & Hedges toning down their sponsorship soon added up and the lack of funds made his team go from bad to worse in 2003. However, despite this, Jordan delivered an improbable race win in Brazil 2003 courtesy of Giancarlo Fisichella, the first for Fisichella and the last Formula One victory for the Ford Motor Company and the Jordan team. In 2001 Jordan sued Vodafone for allegedly breaking a three-year sponsorship agreement worth $150 million but lost the case creating further setbacks for Team Jordan. Jordan's steep fall from third in the constructors in 1999 was now out of control. Despite new sponsorship from Trust computers and the addition of "Quick" Nick Heidfeld and a promising young rookie in Timo Glock for 2004, Jordan was in serious trouble. Jordan retained complete ownership of his team until 2004 and his rejections of rumoured approaches for buy outs (most notably from Peugeot and Honda) may have cost the team greater success. Jordan, however, said at the team's final race that they in fact won five times—the fifth being their survival on such small funds. Midland Group, financed by wealthy Russian-Canadian businessman Alex Shnaider, bought Jordan Grand Prix in early 2005, and the team was subsequently renamed MF1 Racing for 2006. The team was sold again in 2006 to Dutch car manufacturer Spyker Cars to become Spyker F1 for 2007, and then sold once more to become Force India in 2008. Force India still competes in Formula One and operates out of Jordan's old premises at Silverstone. In 2009, Jordan returned to the F1 scene as a pundit for BBC Sport F1 coverage alongside Jake Humphrey (who was later replaced by Suzi Perry) and David Coulthard. Jordan wrote a monthly column called "This Much I Know" for F1 Racing magazine, until they relaunched with Murray Walker writing instead. Jordan also worked on a TV series called Eddie Jordan's Bad Boy Racers. In 2007 he was appointed Chairman of Rally Ireland, a round of the World Rally Championship. Jordan has broken many stories before they were due to be confirmed; these include Lewis Hamilton's move to Mercedes, Michael Schumacher's return in 2010 and Felipe Massa's departure from Ferrari. On February 11, 2016, it was announced that he would be one of the new presenters for Top Gear. In March 2016 he was announced as Channel 4's lead analyst for C4F1 . Jordan loves rock and roll music, and he plays the drums. Until 2007, his band's name was V10. A cut-down version of the band is currently gigging at various venues around the world under the name of "Eddie & The Robbers". Jordan is a fan of Celtic, Coventry City and Chelsea and has been linked with takeover bids for Coventry. Jordan is also a Celtic shareholder. Jordan's other sporting interests include golf and horse racing; he has horses in training with Mouse Morris. He has several other companies still owned partly or wholly by himself, including the vodka brand Vodka V10 and the energy drink brand EJ-10 and Bulgarian property company Madara Capital, that develop Karadere beach, where he was also a director. Jordan is a patron of the child cancer charity CLIC Sargent., a supporter of the Conservative Party and a member of both the Royal Dublin Golf Club and the Royal Cork Yacht Club. Jordan published an autobiography, "An Independent Man", in May 2007. He is married to Marie (née McCarthy), a former Ireland basketball player. The couple have been married since 1979 and have four children: Zoe, Miki, Zak & Kyle. Their main base is in Ireland where Jordan keeps his personal helicopter, and he has homes in Wentworth, South Kensington, London and Monaco, where he keeps his yacht. He was the subject of This Is Your Life in 2000 when he was surprised by Michael Aspel. Jordan has been awarded two awards in Ireland, honorary doctorates from the University of Ulster and Dublin Institute of Technology. He has received the James Joyce Award from the Literary and Historical Society of University College Dublin, one of the largest student societies in Ireland, to honour his contribution to motorsport in Ireland. He also received the Gold Medal of Honorary Patronage of the University Philosophical Society of Trinity College, Dublin to honour his contribution to motor racing and his charity work over the years. In March 2012, it was announced that Jordan had received an honorary OBE for services to charity and motor racing. ^ "BBC's Formula 1 team". BBC News. 17 January 2011. Retrieved 1 April 2011. ^ Sweney, Mark (8 March 2016). "F1: Murray Walker and Eddie Jordan to join Steve Jones on Channel 4 team". the Guardian. Retrieved 11 May 2016. ^ a b c d e f g Jordan, Eddie (2007). An Independent Man. Orion Books. ISBN 978-0-7528-8950-4. ^ a b c Aspel, Michael (7 February 2000). This is Your Life (Television). London, UK: BBC. ^ "Coulthard, Jordan & Brundle join BBC". BBC News. 24 November 2008. Retrieved 1 May 2010. ^ a b c d "The Big Interview: Eddie Jordan". London: Sunday Times. 13 August 2006. Retrieved 17 May 2010. ^ "Eddie Jordan and Sabine Scmitz join Top Gear line-up". From the section Entertainment & Arts. 11 February 2016. Retrieved 11 February 2016. ^ "United shares: Jordan joins in". The Guardian. ^ a b c d "Formula 1 analyst Eddie Jordan made honorary OBE by Queen". BBC News. ^ "O'Neill invests £2m in Celtic". BBC News. 31 July 2001. Retrieved 1 May 2010. ^ "Who's backing whom at the election?". ^ Macauley, Ted (15 April 2001). "TRUE GRID; Ten years ago Irishman Eddie Jordan was going nowhere fast". Sunday Mirror. Retrieved 17 May 2010. ^ "Eddie Jordan". Retrieved 28 September 2016. ^ "F1 Boss Eddie Jordan On Pole Position At UU Graduations". University of Ulster. 3 July 2002. Archived from the original on 1 February 2014. Retrieved 18 January 2014. ^ "Pierce Brosnan and Eddie Jordan awarded doctorates". Dublin Institute of Technology. 23 June 2003. Archived from the original on 1 February 2014. Retrieved 18 January 2014. Wikimedia Commons has media related to Eddie Jordan.